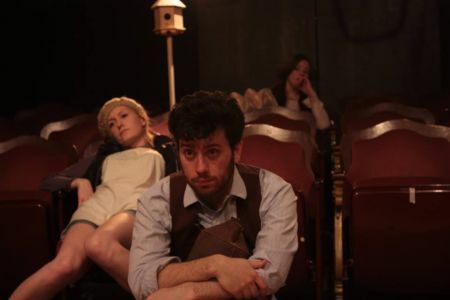 If you like theatre that is written with originality, performed by passionate, talented actors and challenges its audience as much as it entertains, check out the Spiel Players production of Two Plays by Marguerite Duras. Onstage at Toronto’s Fraser Studios, these plays are a one-two theatrical punch not to be missed. Two Plays by Marguerite Duras is comprised of the plays Savannah Bay and Le Shaga. Both are very different and very engaging, surreal and dreamlike. One is sweet and tender, the other is way ‘out there’. It’s a little like seeing two Fringe plays back to back at the same venue. I must admit that I was completely ignorant of Marguerite Duras and her work before taking advantage of the opportunity to review two original adaptations of her work. So here’s a briefing, in case you are in the same situation. Duras grew up in Southeast Asia, including Cambodia and modern day Vietnam,where she was beaten by her family. After her father died she moved to France. She was 17. Duras studied mathematics, political science and law before joining the French Communist Party. Working for the French government, she acted as a de-facto censor in World War II. Her husband was sent to Buchenwald concentration camp and barely survived, weighing just 83 pounds when he was freed. Wow, right? So Duras has an immense inventory of life experiences to draw from. As a result, I find it no wonder that her plays, at least these two, are experimental, challenging and somewhat surreal. They are also dreamlike and fantastic. Both productions feature three actors, with Lisa Hamalainen and Peyton Le Barr performing in both. In Savannah Bay Deborah Grover completes the trio of actors, playing a woman who seems to be losing her memory. At first the setting seems to be a nursing home, with a Young Woman (Hamalainen) visiting Madeleine (Grover). As the two women have an intimate chat, Singer (Le Barr) circulates throughout the cozy theatre. She eventually joins us in the audience, sitting dead centre in the seats. As Madeleine and Young Woman have the same conversation that they have every day, the singing helps forgotten memories resurface. Savannah Bay is a wonderful story, and a delightful way to escape the painful temperatures we are currently experiencing in Toronto. When the play ended I asked Mike, my guest for the evening, if he thought the two women represented one person talking to herself. He agreed, but that’s just our interpretation, who knows what yours will be. Between Savannah Bay and Le Shaga, a birdhouse is placed in the middle of the theatre seats, taking the place of Singer. Sunflower seeds are scattered across the entire stage. This time around Paulo Santalucia as H joins A (Le Barr) and B (Hamalainen). A and H speak English, while B speaks Shaga, a made-up language that is contagiously cute. On hand one, Shaga is utter nonsense. On the other hand, Shaga might be entirely profound. Imagine a cross between Harpo Marx, the alien Muppets from Sesame Street and “conversations” one might have with their pet. That might be a way to describe exchanges with someone who speaks Shaga. Speaking of The Marx Brothers, Le Shaga is a beautiful, anarchic play. It’s also very physical, with the actors almost dancing at times. For some reason Le Shaga reminded me of the surreal art of Salvador Dali and M. C. Escher. Throughout Le Shaga A and H repeat their lines, spoken in English, over and over. They change their tone and inflections. The also change the syllables they emphasize. Eventually, the same words, spoken in the same order, take on numerous meanings. Sentences morph and evolve before our eyes. It all becomes a blur, the original thoughts and emotions lost, perhaps forever. By comparison, B’s made up Shaga seems so much more straightforward and easier to understand than my mother tongue. I’m not going to say that Mike and I completely understood everything going on in these the plays. Quite the contrary, and that is a big part of the gift of these pieces. The mystery and room for interpretation is part of the beauty of Two Plays by Marguerite Duras. I suspect that if one were to thoroughly study these two plays, they would discover nuance after nuance, allegory after allegory, symbol after symbol and metaphor after metaphor. That would take a lot of passion, work and time. For people fortunate enough to see this production the amazingly talented cast and crew have done some of the legwork for us. Hats off, or should I say berets off, to the passion and commitment they have brought to the work. Watching these pieces Duras involves a certain amount of thinking and imagining. It’s cognitive exercise, and like most workouts, attending this production of Two Plays by Marguerite Duras is very rewarding. As an added bonus, it was nice to enjoy a bottle of French beer while being engaged in two wonderful plays. If there was anything I didn’t like about Two Plays by Marguerite Duras it is that I likely won’t have a chance to see this mounting again. I’d love be in the audience for another showing to gain a deeper, better understanding, or maybe even another interpretation!